Please keep the family of baby Dean Gandy in your prayers. 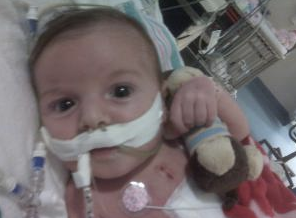 Dean was born on August 3rd with HLHS and an intact atrial septum and was in the PCICU at MUSC the same time as Chase. This sweet baby lost his four-month fight on December 21st and has earned his wings in heaven. We didn't have an opportunity to meet this family or their sweet boy, but when one heart family loses a precious soul, all heart families feel the loss. Please lift up his parents and family in prayer as they say goodbye to this precious baby during his funeral service tomorrow, Sunday, December 27th. I can't even begin to imagine what they're feeling! Here is a picture of this adorable, sweet angel from his CaringBridge website. I don't know how I missed this, but I will be praying for this precious family.